We thought we’d never make it, but after a few mishaps along the way, we were finally leaving US soil and I was using my passport for the very first time. I wondered how much things would change once we crossed the imaginary line and entered foreign soil. It was the same piece of land, how much different could life be for our neighbors to the north? Surprisingly, quite different in some ways. In others, it was exactly the same. The first thing we noticed was that we had entered into the metric system. Luckily the GPS we were using changed to kilometers and told us our speed so that Ryan didn’t have to decipher it from the little red kilometer lines on the car’s speedometer. And gas was in liters so that required some mental conversions before we knew how much we were paying for a tank of gas. Have I mentioned that I hate math? I let my engineer husband handle the calculations. The other thing we noticed as we drove down the highway was their street signs. Our favorite was the caution sign with a silhouette of a moose on it and the notice of “Night Danger” posted below. Sadly, we never did see a moose. And of course, there was the difference in currency. We had changed money to Canadian before crossing the border. The US dollar that day was worth two cents more than Canadian so we got a little extra money. Yea! And their currency is very similar to ours so there was no confusion there. But their taxes are substantially higher than those in the U.S., especially on beer. In doing our research into Thunder Bay, we couldn’t decide whether we wanted to stay at a hotel downtown or one a little farther into the wilderness. We opted for the wilderness because we wanted a little peace and quiet. Also, we had read some online reviews for the downtown hotels and were a little afraid of what we’d find. When we finally hobbled up to our hotel, we were glad we made the choice to stay farther outside of town. The hotel was surrounded by a fairly wooded area with a small range of mountains and a pond in the back. Our luck temporarily shifted to our favor because we ended up with a mountain-view room. The room was nothing spectacular, but it was clean and had a sliding door that opened onto a beautiful vista, which we stared at for several minutes before tackling the chore of finding someone to fix a busted tire on a Sunday. A few minutes of searching told us that the smaller local shops were all closed on Sunday, but there were a few bigger chains that would be open and hopefully able to help. Next, we decided to explore Thunder Bay and find dinner. Pizza and a cold beer was the only thing that sounded good. And with a GPS, we thought finding dinner would be no trouble at all to find. We could not have been more wrong. First, if you’ve never been to Thunder Bay, it’s not a touristy town. It’s very industrial. If you’re familiar with Duluth, MN, I was expecting something similar to that type of area: cute shops and restaurants along the water, a marina area, and beautiful water views. Instead, Thunder Bay has factories occupying the best water real estate and the downtown area is much more run-down and dirtier than Duluth. As we undertook the quest to find a pizza place, we became more and more frustrated. Each location the GPS suggested was either out of business, carry-out only, or really disgusting. We finally found Boston’s Pizza, a local chain that reminded me of a nice Pizza Hut. So far, we were pretty discouraged with our trip, but hoped the next day would be better. Our main priority for Sunday was to fix the car. Then vacation could begin. The first place we tried said they might be able to fit us in Monday afternoon. That wasn’t going to work. We eventually found a WalMart and they were able to get us an appointment. After waiting for the tire to be evaluated, finding out it couldn’t be fixed and had to be replaced, waiting for installation, losing a credit card at the place we had lunch (thankfully it was found), finding out the car had been done for about half an hour and nobody told us, spending a nice chunk of our vacation fund on a new tire, then spilling a full, hot cup of coffee all over ourselves and the car, we were finally on our way. The first stop: Sleeping Giant Provincial Park. There is a fascinating story behind this rock giant. It’s too long to tell, but if you click here, you can read about the legend. As I mentioned in the last post, Lake Superior is breathtaking and we wanted to get some nice photographs of the lake. We thought a provincial park would offer the best opportunity for that. Had we been more prepared, it would have. After driving quite some distance away from Thunder Bay, we reached the park and immediately noticed how thick the woods were on this peninsula. The trees were as dense as matted dog hair on either side of the road. Looking into them was nearly impossible, but that didn’t stop the deer from coming crashing out of the trees in front of our car. I swear we saw at least 100 deer on our drive through the park, which made for a very slow ride. But the coolest thing we saw was a wolf running down the side of the road and ducking into the cover of thick foliage. Unfortunately it all happened too quickly for me to take a picture. We kept waiting for a break in the trees so that we could see the lake. One never appeared. At a gravel parking lot along the road, we pulled over and looked at a map posted on a park sign hoping we’d find access to a scenic overlook or public beach. Instead, we discovered that those things could only be reached by hiking quite some distance through the woods or by the campground area that was currently closed because it was still considered off-season (a term we’d encounter several times throughout the weekend that would alter our entire trip). We considered hiking into the woods until we calculated how long it would take and that we were in no way prepared for a long-distance hike (improperly dressed, no bottles of water, etc…) And after seeing a wolf, we both admitted this wilderness needed to be taken seriously. Neither of us wanted to become those unprepared tourists who get attacked by a bear and end up on the evening news as examples of what you don’t want to do in a Canadian provincial park. So we got back in the car and decided to drive a little farther to see if we could find water. About ten minutes later, we finally found what we had been so desperately searching for. Silver Islet is a small town at the end of the peninsula and was the first silver mine in Ontario. The old miner’s homes are now private summer cottages and the general store has been restored and is open during the summer. Since we were there in the off season, no one was around and nothing was open. It was a little creepy. But the view is beautiful and we finally got the shots we were looking for. That night we celebrated with an anniversary dinner at The Keg Steakhouse. I don’t eat a ton of red meat, but that night I had filet mignon with asparagus, shrimp and scallops in a béarnaise sauce. Everything about it was perfect. The meat was just a little red, but not raw. The asparagus was the perfect combination of crispy and soft. And scallops are my most favorite thing in the whole world; it’s not too often that I don’t enjoy a scallop. The next day we checked out of the hotel and embarked on our final two Canadian adventures. The first was a stop at Kakabeka Falls, a trip which would have gone smoothly if we had trusted our instincts to follow the signs and not the GPS which led us on an excursion through unmarked, unpaved farm roads. After the previous tire adventure, we weren’t hoping for a repeat in the middle of nowhere Canada. Thankfully, we made it to the falls, car intact. However, we had to scramble to find change for the parking meter. Stupidly, we had the idea that morning to use all of our Canadian change in the vending machine at the hotel to buy unique candy and prevent a return home with pockets full of money we couldn’t use. Once correct change was in the meter and we had taken photos from every possible angle of the majestic, but nearly dry waterfall, we stopped at a cute little place called the Metropolitan Moose for muffins and hot coffee. That morning the temperatures were in the upper 30s and my hands had nearly gone completely numb while firing off photos of the falls. On a full stomach and with ten fully functions fingers, we made our way to the last stop: Fort William Historical Park. The park is a recreation of the original fur trade post from the early 1800s. The detail and accuracy of the fort is quite spectacular. But once again, that nasty little term “off-season” would come back to rear its ugly head. The fort is open year round and offers tours, but the real action is in the summer when all the activities are in full swing and the park is fully staffed with actors who take you back and give you the opportunity to experience what the fort felt like when it was operating in the 1800s. We were the only ones on our tour, but, in a way, it worked to our advantage. We had a tour guide who was fully decked out in authentic 1800s attire and took us on a complete behind-the-scenes tour of the fort. Although it would have been a lot of fun to see it fully operational, we had an amazing afternoon stepping back in time and learning what life was like during the height of the fur trade. One of my favorite parts was learning of the journals that were kept and how they were used, along with a lot of tedious note-taking, to create maps of that region in North America. Sadly, not many journals survived, but some endured the harsh environment and were later printed as books. The journals of Alexander MacKenzie, explorer and employee of the North West Company (the company which owned Fort William), are one example of journals that were published (I’m working on tracking down a copy of the book). After leaving Fort William, we began the long trek back to Minneapolis, somewhat relieved to be putting an end to this crazy adventure. On the way back, we listed all the things that had gone wrong: the blown-out tire, a lost credit card, spilled coffee, an elusive lakefront, somewhere along the way I scratched my eye, everything being “off-season,” and at one point, I was even rammed by a young cow complete with a small set of horns (I was told he was “friendly,” thankfully no serious damage was done). But then we started to list all the things that we never would have experienced had those things not happened: meeting Anne and realizing the power of the kindness of strangers, seeing a wolf dive into the dense forest, learning the legends of the people who were the original inhabitants of this great nation, and realizing that there are more ways to live than just the one we’re used to. I think the best thing we got out of our trip to Canada was stepping outside of our comfort zone, granted it was only a small step, but even shaking up your life a little bit is a good thing. I thought of how much my life has changed in the year I’ve been unemployed and how thankful I am for that. I’ve taken a chance on trying many new things and most importantly, I’ve taken a chance on my writing. It’s terrifying to write about my experiences and throw them out to the world not having any idea or control over how they’ll be received. But I also realized that the only thing more terrifying than that, is not writing at all. Since I changed my major from biology to writing in college, I knew I wanted to be a writer. After graduation I accepted a job in the corporate world, which provided a steady paycheck and an opportunity to do some copywriting, but also became an excuse for why I wasn’t continuing with the writing life I dreamed about prior to accepting my diploma. Lately I’ve been hearing a lot about your “authentic self” and realized how much I’ve crushed my own spirit and destroyed that authentic being. Sure, it was easy to blame work for a lack of time and energy to write, but there was also that inner critic who kept pounding into my head that I wasn’t good enough. We all have that voice, whether we want to be a writer, an artist, an athlete, a scientist, a musician, an actor, or anything else. And we all need to find the strength and the courage to tell that voice to SHUT UP. It’s easier some days than others. And sometimes we let that voice completely take over until we don’t even recognize our authentic self at all. That’s when we need a wake up call, maybe several. For me, it started with a bout of unemployment and I got a reminder during a trip to Canada. As Ryan and I were thinking of all the good experiences that came from the bad, a famous saying came to mind: When life gives you lemons, make lemonade. And that’s just what I did. Well, lemon squares to be exact. I knew I could count on The Found Recipe Box to deliver the perfect recipe for this post and it didn’t let me down. 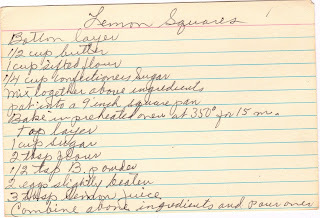 Not only is this the best lemon square recipe I’ve ever tasted, but it’s easy to make and the ingredients are ones that I commonly use so there was no need to run to the grocery store and risk losing another tire (although, it might have provided another great story!). And the bottom layer is shortbread – my favorite! 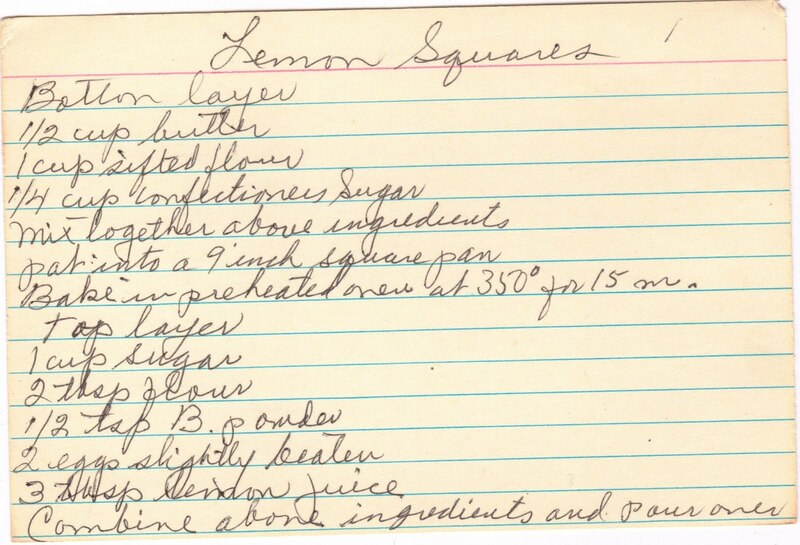 So if you’re looking for a delicious way to prove that something sour can be turned into something amazingly sweet, take your lemons and make some squares. Now that raspberries are starting to come into season, the prices are lower and they make a great addition to this treat. The combination tastes like summer and you can’t help but smile when you take a bite. I’m already looking forward to the next time I get to use my passport. Hopefully it will be as I cross the Atlantic and step into one of the European countries on my list of places to visit. Or maybe it will be in Vancouver when I finally get to explore the Pacific Northwest. Regardless of where it is and how many tires are lost along the way, I will keep the taste of lemon squares in my mind to remind myself that inside every adventure resides a poem, and that shortbread and sugar can transform any puckered mouth into a smile. Were you even in Thunder Bay? The city was formerly two towns, which merged. So there are, technically, two former downtown cores as well as a built up intercity areas with a huge mall and many stores. If you stayed in Tbay on the border side, you were in Fort William, which is a tad neglected. But the Port Arthur downtown is a vibrant core with amazing views, outdoor concerts, cute local shops and restaurants. You obviously did not do any research before passing through Thunder Bay. Given this, I hardly think you are in a position to dispense advice on travelling to the city. My advice? Do some research, and to other readers I suggest not taking the advice of one person's anecdote. Thanks for the feedback about the Thunder Bay area, we obviously missed the spots you were talking about downtown. We did do research into the area, but like I said, unfortunately a lot of the things we wanted to do were closed or restricted due to it being the off-season. I am in no way offering travel advice, I was merely recounting the story of our trip and apologize if I have offended you. We enjoyed our time in Thunder Bay and would love to return during the summer when everything is fully operational. 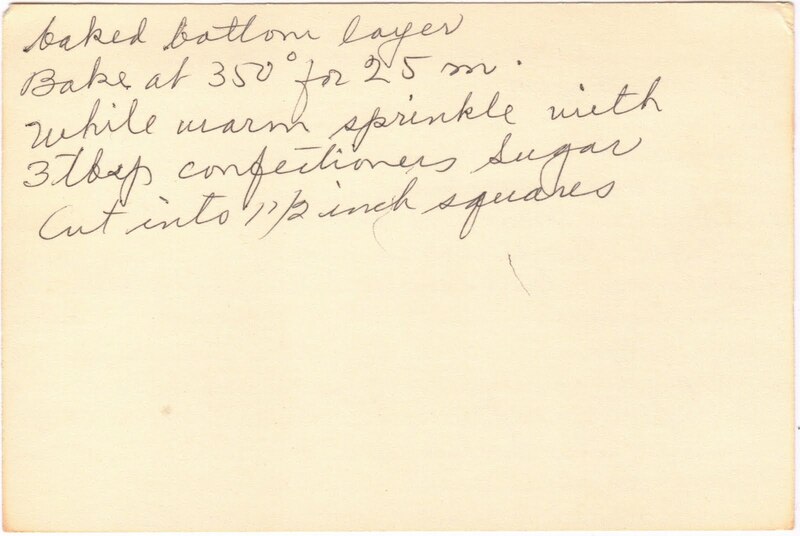 While at an antique show, I came across a wooden recipe box packed full of old recipes – some dating back to the 1920s. It made me sad to think that someone’s collection of recipes was being sold instead of lovingly tucked into a family member’s kitchen and cooked for special occasions. I knew I had to buy these recipes and show them the love they deserve. I also decided to start this blog to share the recipes and document my journey through the box. My hope is for each recipe to find a new home (beside my own) where it can be shared and loved for many generations. © 2010-2016 by Molly Anthony. All rights reserved. Not for commercial use. Please do not re-post my original photos or writing anywhere without my written permission. Click here to learn more about my journey to France.